In June, 2017, I was invited to participate in the Women on Water event. It was a wonderful event and during my time there, I met a lovely lady named Eileen. Eileen was there by herself and I went over to introduce myself and talk to her a bit about her pink hair. She had put it in for the weekend to show she was a wild woman and I thought it was very cool, as was she. Over the weekend, Eileen and I became friends and we have kept in touch ever since. As I don’t know many people in Muskoka, it is nice to have a friend to visit with, share a meal or go for a hike with. With my birthday just passing, Eileen wanted to take me out to lunch or supper, which I thought was very sweet. 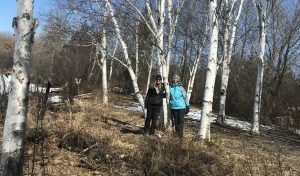 I suggested we wait a few weeks and see if I would be well enough to go snowshoeing at Limberlost, but I wasn’t feeling that confident yet. I remembered a few years ago, my mom and I had reservations at the Parkway Cottages for a few days but they wouldn’t let us check in until early afternoon. As we liked to get up and get going early, before traffic got crazy, we had come to hike this trail to kill some time before our check in. It was a nice easy walk, but also very scenic and part of the TCT or as they now call it, The Great Trail, which I have done many outings on. So when I spoke with Eileen, I asked if we could possibly meet up here for a hike before heading to lunch, and she agreed. 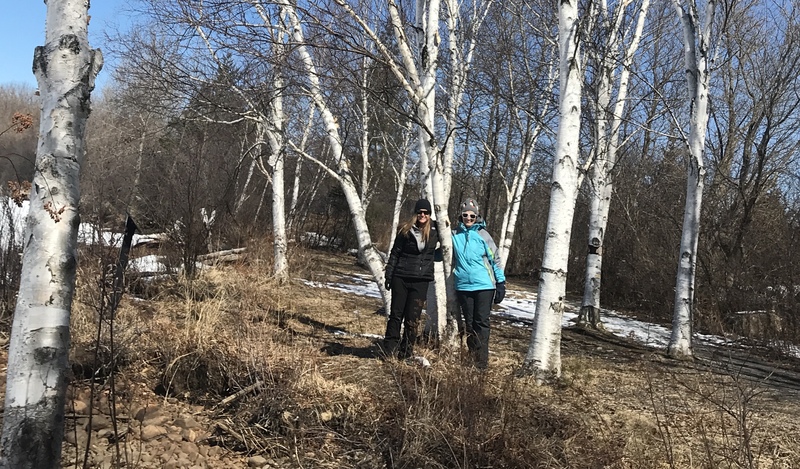 We met at the Avery Beach Parking Lot and when I arrived, I asked Eileen if she wanted to park a car at each end and then we didn’t have to retrace our steps and could see more of the trail. She thought that was a great idea, so we took her car over to the other end of the trail at Center Street and parked, and off we went. The start of the trail was very icy and steep and we struggled a bit to get past that section, but after we did, it was smooth sailing for the most part onwards. 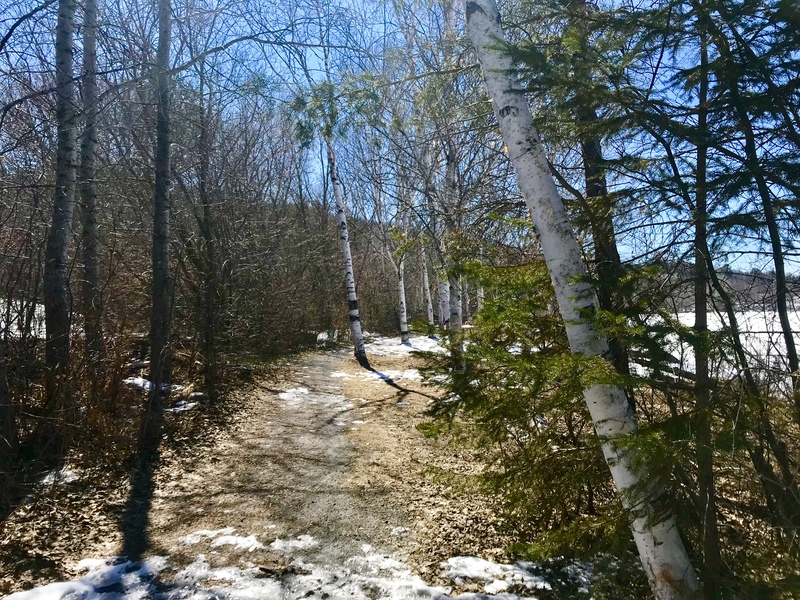 The trail was quite similar to my Hardy Lake experience, with sections of trail being bare ground, some being packed snow and some being ice, but it was less ice this time and more packed snow and bare ground, which was nice. We sat on the bench (pictured above) for a while and watched and listened to the ice moving, shifting, cracking and creaking. It makes such cool noises. There was a few huge cracks running through as well which I filmed and will be in my video. I kept my eyes on the hole above where every so often water would gush through and bubble. I found it fascinating. We continued on, finding some plaques and reading them over. One I found quite interesting was about the time when the government was giving away land to people for free if they would live there for a certain number of years and farm it etc. Eileen had heard all about this previously and explained to me that the settlers weren’t able to farm as they did in the old country because of the Muskoka rock and so they began doing other things, such as logging and tourism. Pretty interesting stuff. 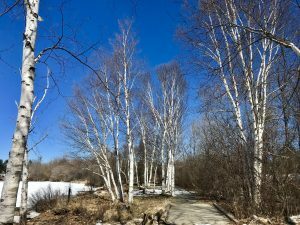 Next we came up to my favorite section of the trail, that I call The Birches. It is filled with beautiful birch trees, which I just love, and it seems Eileen does too. We took a bunch of photos and even shot a very fun video there with us doing a Benny Hill type of skit. You will have to check out the video to see it and get a good laugh. It was way too much fun! We saw a lot of neat plants, trees and even a birds nest that was kind of cool. And of course the grass was poking through in a few spots which I was super pleased about. Any sign of spring just makes me smile broadly! We continued on our way and as we got closer to Avery Beach, where my car had been parked, we finally came across the sign to tell us we’d made it there. When we walked out onto Avery Beach, the wind found us and it was very cold. The temperature today was expected to be -14 with the windchill and we hadn’t noticed it at all until we reached the open area. It was, however, incredibly beautiful and worth the little bit of freezing cold winds that seemed to blow right through our clothing and into our bones. Eileen was tough and we both sucked it up and decided to head towards the other part of the trail where the floating docks were. We passed the pavilion and started down the next section of trail when we realized we’d dropped something at the beach. By the time we got back, we both were starving and decided we would save the other section of trail for the next visit. So we headed back to my car and went over to the other trailhead to get Eileens car and then headed to West Side Restaurant which is very close by and had a lovely lunch together. If you’ve never been there, I highly recommend it. Great prices and delicious food. I have been there quite a few times and have never been disappointed. Thanks so much to Eileen for braving the cold and coming out on a hike with me. When you are walking along in the sunshine enjoying someones company and chattering away, it makes for a lovely afternoon. I hope you enjoyed our hike today at Hunter’s Bay Trail. Please check out my youtube channel for the video of our adventure publishing Thursday or click here for a sneak peek! Eileen seems VERY Cool! Looks like a gorgeous day, and I’m with you, I’m fascinated when the ice starts talking and trying to break up! Nice video. We had a fresh snow in Michigan today headed 2 miles into the woods, made coffee and oatmeal over a solo bio stove. Simple things in life are the best. Congrats to you and Eileen on making it over that icy trail. Blessings!! !